Any marathon that has “Trample the Weak, Hurdle the Dead” as a race motto and Skull & Crossbones for race medals has to be a cool race. 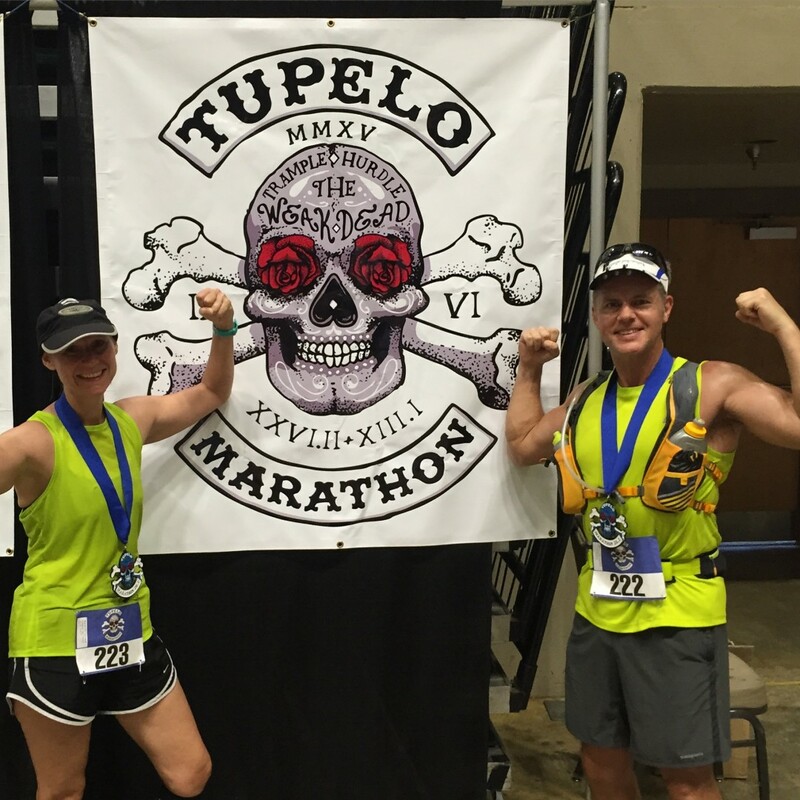 The 2015 Tupelo Marathon on Sunday, September 6, 2015 lived up to those expectations and more. Who in their right mind signs up to run a marathon in the Deep South during the heat of the summer while a course featuring rolling hills? Mrs. D & I were foolish brave enough to do it and live to tell this tale. 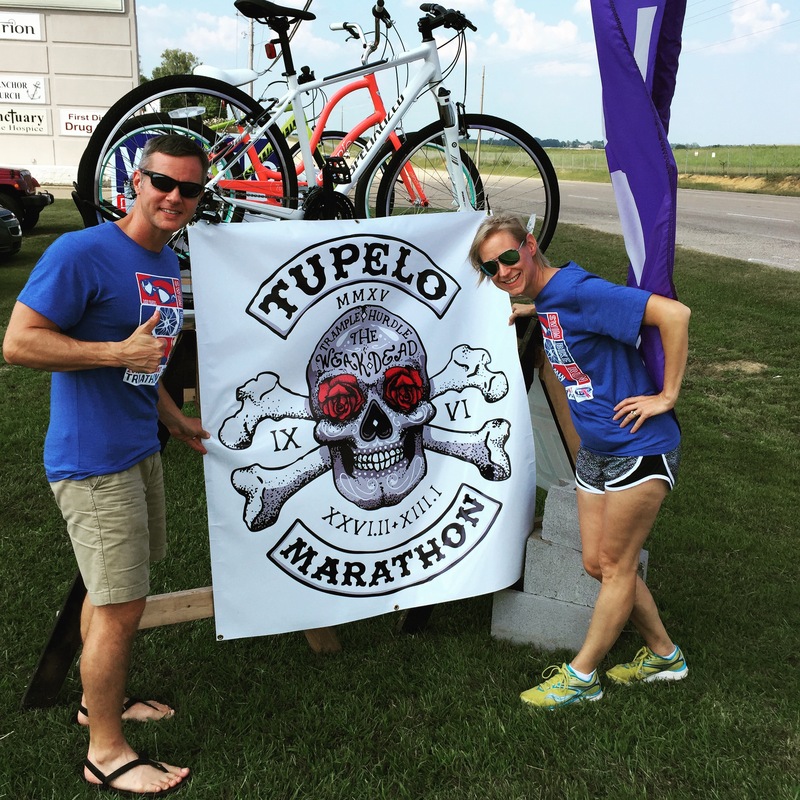 Marathon weekend ended up being pretty busy as the Tupelo Marathon is always held during Labor Day weekend. 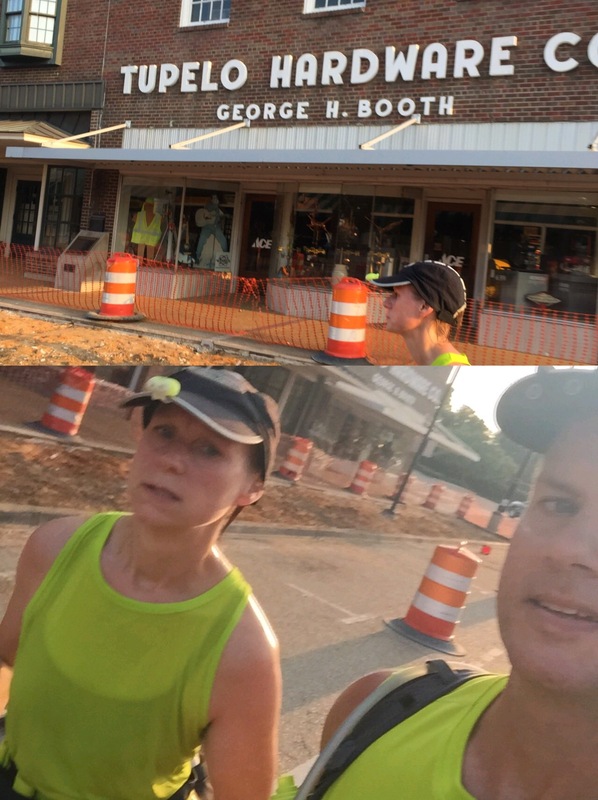 Our weekend started early on Saturday with both of us volunteering to help out at the rescheduled Tri-PTC Sprint Triathlon in our hometown of Peachtree City, GA. Athletes have to get up early on race day, but volunteers have to get up earlier. We were already packed up for our weekend trip, so as soon as the triathlon was over we were on the road. 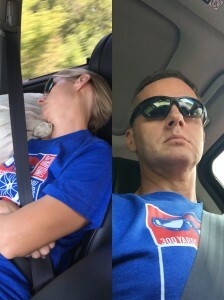 The adjacent picture pretty much sums up our drive to Tupelo. The drive out there was pretty uneventful and, after Birmingham, Alabama, was pretty desolate along the newly redeveloped Appalachian Highway (I-22). We drove straight to race packet pickup being held at Trails and Treads outdoor store in Tupelo. 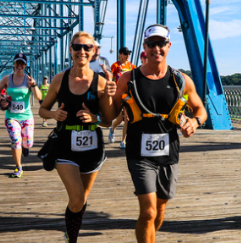 Over the years we’ve learned that it’s always smart to pick up packets early (when possible) to ensure getting the proper t-shirt sizes, correct race numbers, and find out about last minute race changes. Packet pickup was very organized and we also bought some stuff at the store (we like to support vendors who support races). Next stop – the Tupelo Wingate Inn to get checked into our hotel conveniently located a few miles north of downtown along I-22. Further up I-22 is Memphis, home of the blues and where Elvis Presley spent most of his life. Tupelo is where Elvis was born and spent his early years. I had heard rumors Elvis might be there during race weekend. Sure enough, Elvis was there in the hotel lobby to greet us. After getting checked in and setting out all our stuff for tomorrow, we headed back into downtown Tupelo for a wild and crazy Saturday night on the town. Well, it’s wasn’t crazy but we did have a good time. The first thing I did was to set our SiriusXM radio to the Elvis channel to set the mood (it normally stays on the 80’s channel). 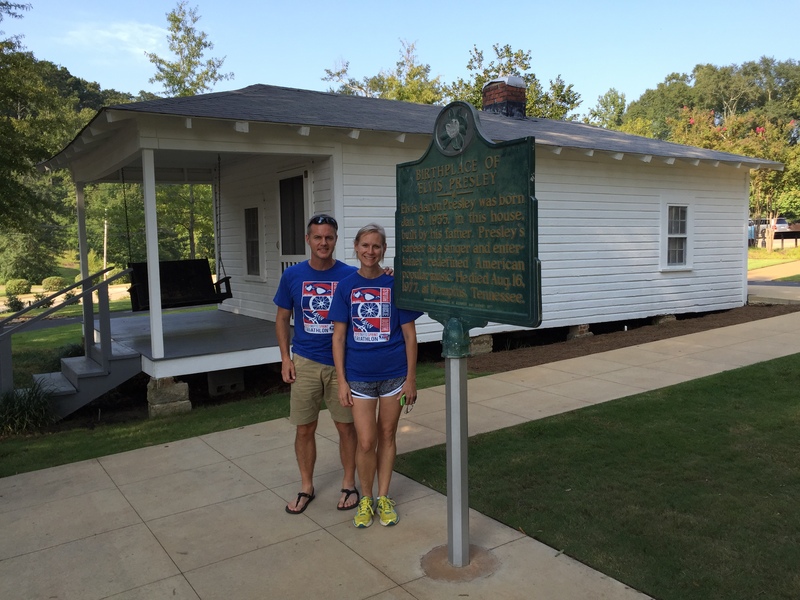 We dropped by Elvis’s birthplace to see the shotgun house he was born and raised in. Dinner was uneventful and consisted of the obligatory carbo-loading pasta feed at the local Tellini’s Pasta Market. One online reviewer described it adequately as a “downgraded Olive Garden”. It wasn’t fancy but good, cheap, and hit the spot. At my insistence dessert consisted of Shipley’s donuts (I cannot lie – I like donuts and these were great donuts). The Elvis radio channel kept us entertained as we drove the Tupelo marathon course, making note of shade, turns, and hills. Indeed there were plenty of turns and hills, but we didn’t notice a lot of shade – apparently a tornado hit Tupelo hard a few years ago. After the course preview, it was back to the hotel and bed. On race day the 3:30 a.m. alarm came early, but we were stoked and ready. 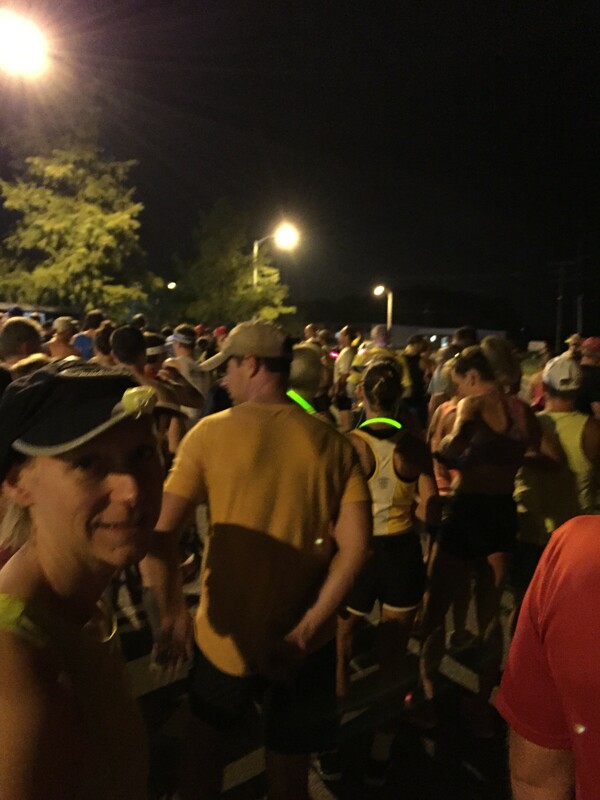 On the road by 4, we were at the starting area at the Tupelo BankCorp South Arena by 4:15am. 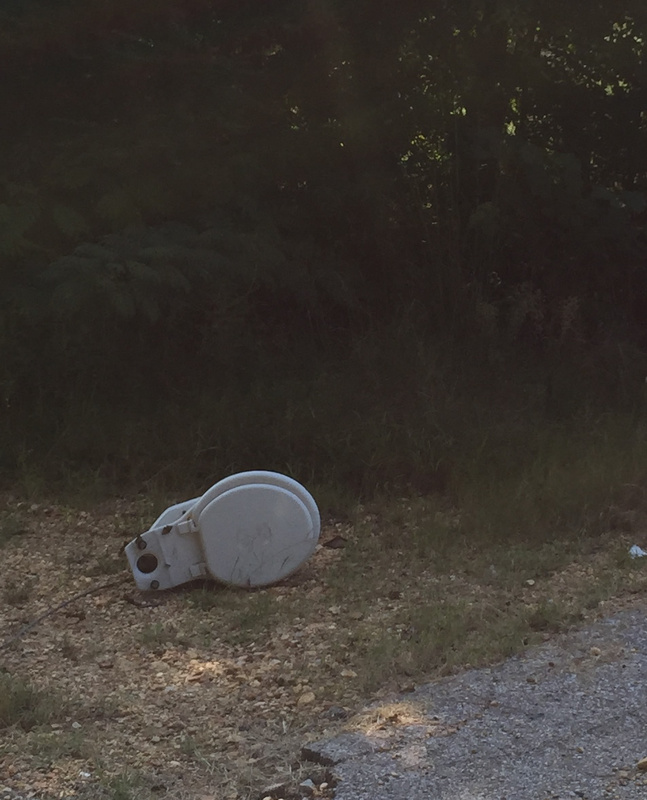 I don’t know what it is about races that make you have to use the restroom, but this race was no different – enough said about that. Due to the heat, the race starts at 5 a.m – a tad earlier than most races. On the positive side, our bodies were still on Eastern Time so that it felt like 6 a.m. On the negative side, we were still sleep deprived from getting up so early the day before. 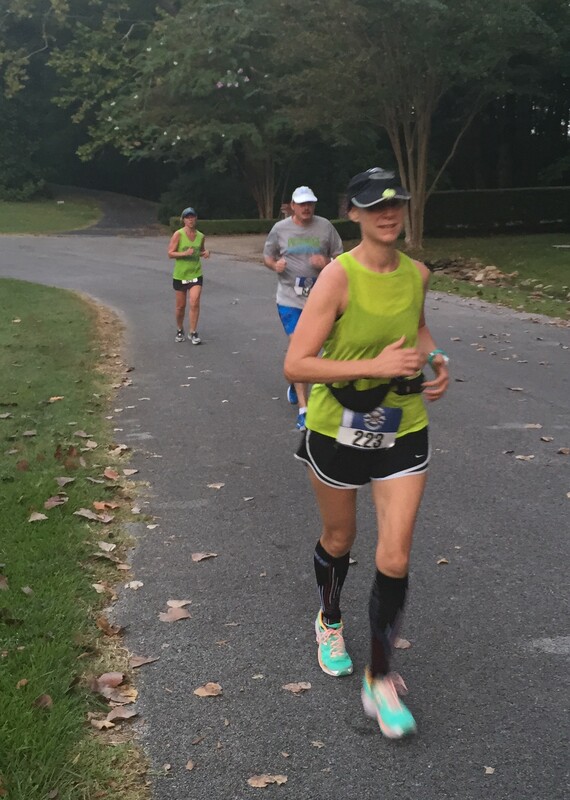 And we’re off – Tupelo Marathon has started! We came prepared with head lamps, although they weren’t really needed due to the street lights. Both Mary Catherine and I prefer the kind that clip onto the visor of your hat which seems to make them not cut into your forehead as much. She was equipped with a water belt and I was equipped with the hydration pack, also full of energy food. We both had bottles of Mary Catherine’s special hydration drink. After a brief prayer by a preacher who was also running in the race, we were off. 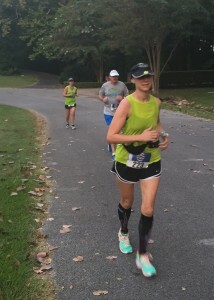 As is usual with most longer races, it takes awhile for the pack to thin out so we got to enjoy listening to other folks talk while we were plodding along half-asleep for the first few miles. Many of those eager and talkative runners were only doing the half-marathon – did they know something we didn’t? 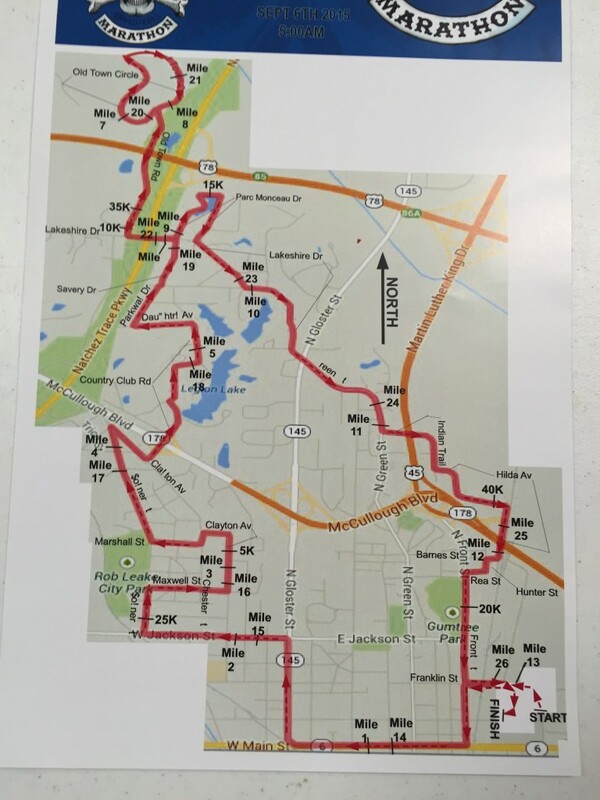 The course itself heads in a generally northwesterly direction from downtown Tupelo. Apparently the course route was dramatically changed two years ago due to the tornado damage. Here’s the course map for the race. Our original “A” goal for the race was to complete it in 4:40 or better. The secondary “B” goal was to finish in 5 hours and, of course, it’s always nice to at least finish the race – regardless of time (our “C” goal). We were ahead of pace and on target to finish in 4:30 at the 10-mile point. The pace had slowed slightly going into the half-marathon point, but we were still ahead of pace for 4:40. 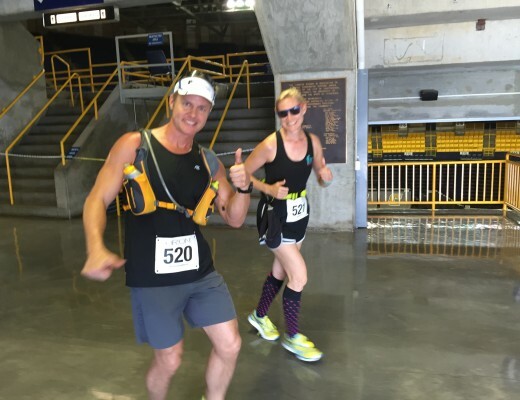 Here’s Mary Catherine crossing the half-way point at the Coliseum. Heading back onto the course from the Coliseum, we headed through downtown and passed in front of the Tupelo Hardware Store, where Elvis got his first guitar. Here’s a shot of us passing by the store. Hmm…Mary Catherine isn’t her normal smiley self, something’s not right. As we settled into the second half of the race, I noticed Mary Catherine wasn’t looking as cheerful as when we’d started the race. She was having trouble “settling in” due to pain from an equipment malfunction – her shoes. I tried to be supportive, but you know how it is guys – nothing I could say or do was helpful. She wasn’t being mean, but I could tell she was hurting. I quietly made note of our slowing pace without making a big deal about it. Our next goal was to find Tylenol for the pain. 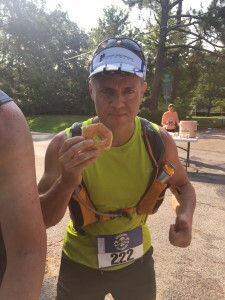 As is the case for many races (and we wish it wasn’t this way) most official aid stations aren’t able to provide pain killers – aspirin, tylenol, ibuprofen, etc. I’m told it’s to reduce liability in case someone has an allergic reaction. Fortunately, we found an unofficial aid station near mile 20 that had tylenol – Bingo! 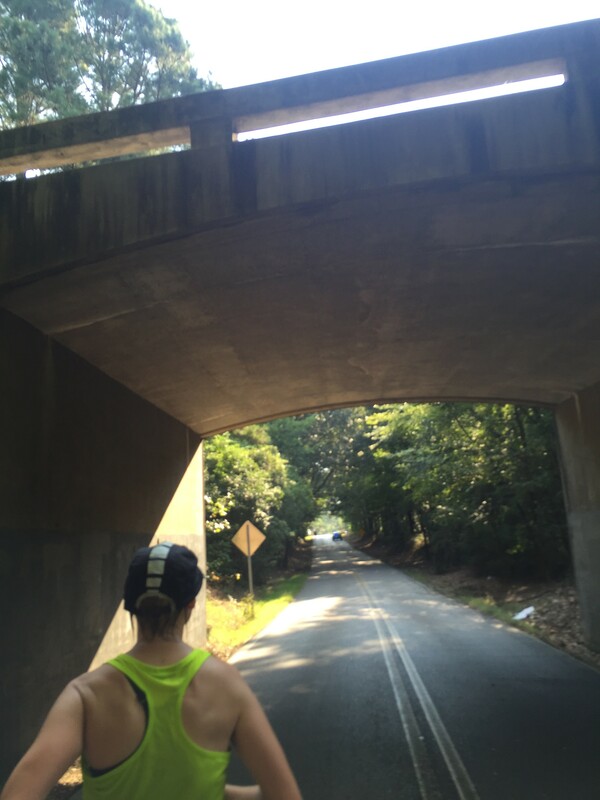 It took a mile or two, but Mary Catherine started to increase pace again. 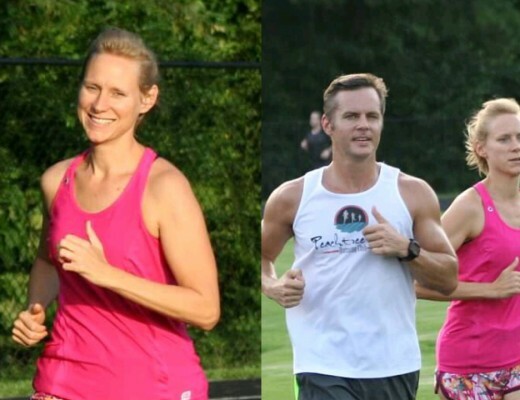 Game on – we were breaking through the infamous “marathon wall”. I found my own “aid station” of sorts near mile 22/23 with some Shipley’s donuts (again) Hey folks, if the metabolic furnace is hot enough it’ll burn anything! 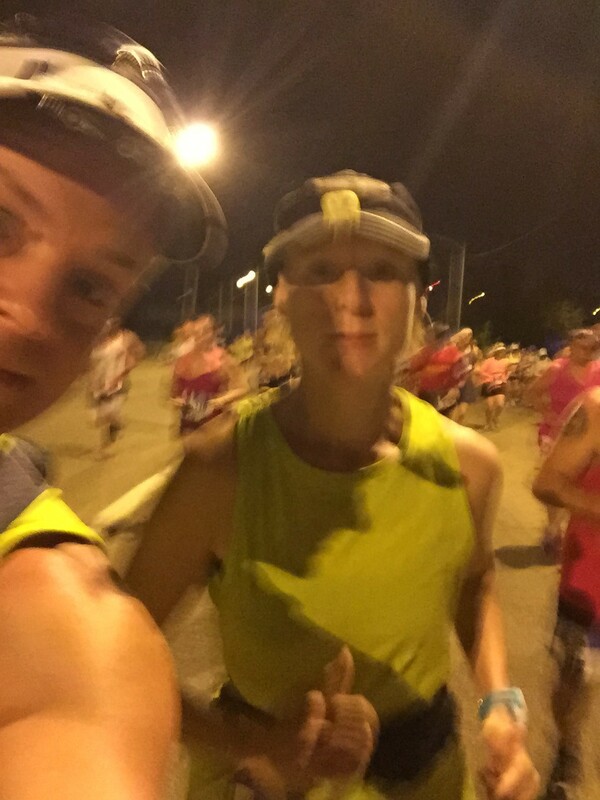 As we neared the final miles of the race, we started passing other people that were suffering. The tylenol was kicking in and our pace was quickening. 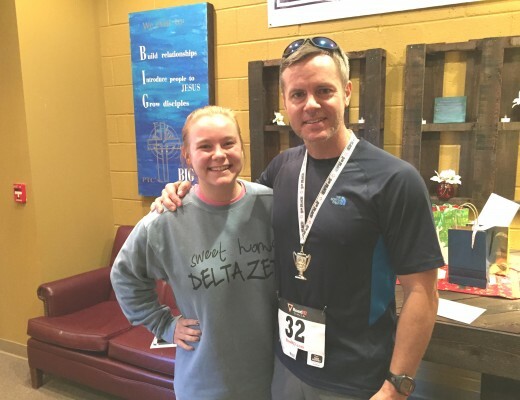 We acknowledged our fellow suffering runners with head nods and words of encouragement. I started doing some hasty time mathematics and privately started to assess whether we’d beat the 5 hour mark. I didn’t say anything to Mary Catherine because I didn’t want to pressure her. With two miles to go we passed by a Tupelo toilet (literally) laying alongside the road. Naturally we need to post the toilet picture. After running through the “scenic areas” of town and the famous Tupelo toilet, we began to enter civilization once more. We were getting close to the finish of our grand journey. 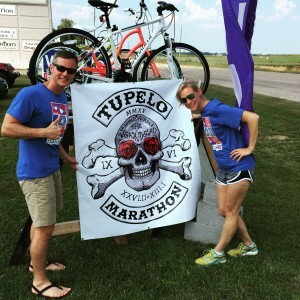 The final mile was an epic climb into Tupelo – a long, slow and subtle “false flat”. Crossing the final bridge, we were lead through a back loading dock door and directly onto the floor of the Tupelo Coliseum! Very cool. I could see the clock was exactly 5 hours. 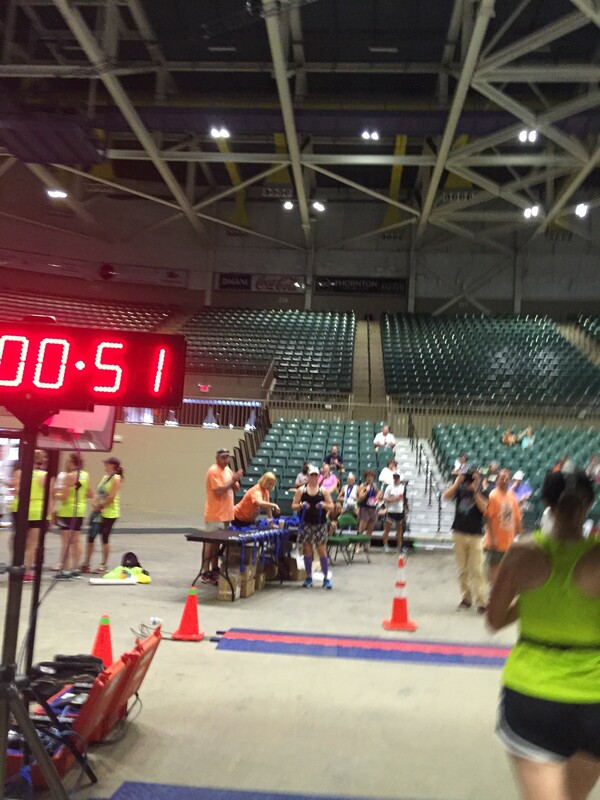 Now it was a matter of whether we could cross the line before 5:01 and we did. 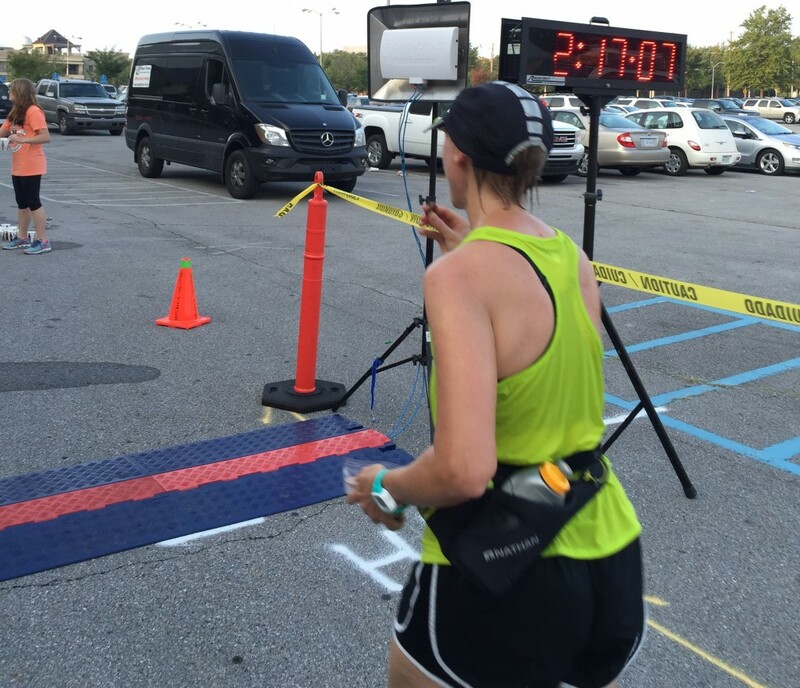 Here’s a picture of Mary Catherine crossing the finish line in 5:00:51, with an official finish time of 5:00:52. Here’s a link to a video of the finish with me taking that picture (we’re at the front of the video, you don’t have to watch the whole thing). Great race! We loved the course, the volunteers, the home town feel. 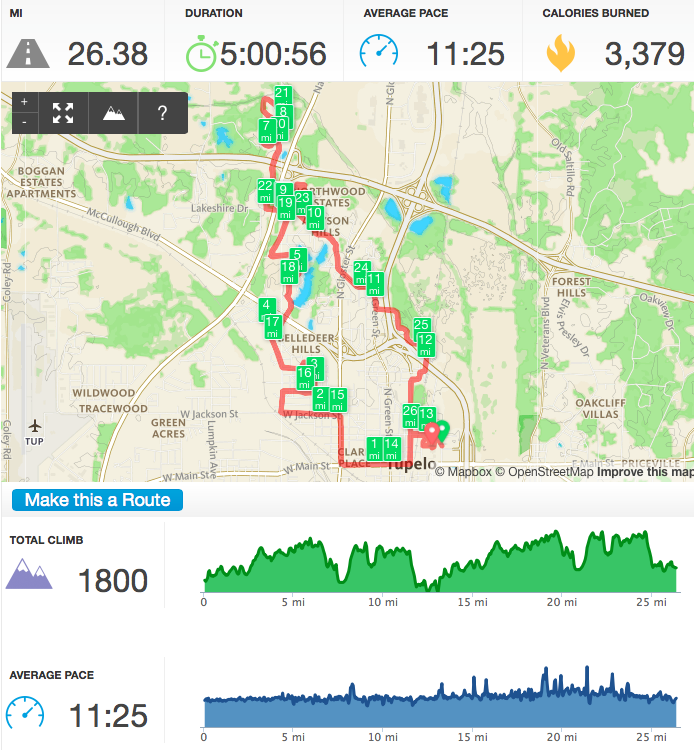 It’s not a super hard course, but it’s deceptively tough – not really a PR course. The tie dyed shirts were great and the finisher’s medals the best we’ve seen so far. No, we didn’t finish in 4:40 but we did finish in 5 hours and had a blast doing it together. 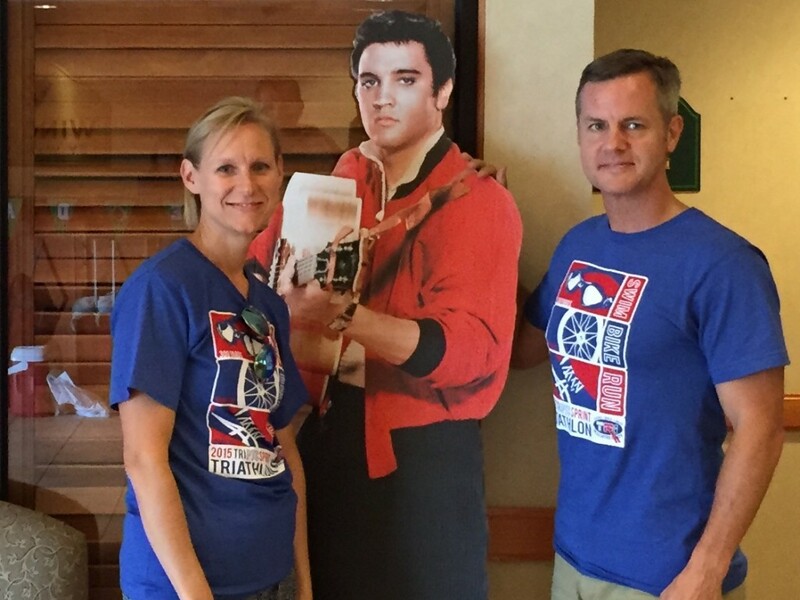 Here’s a picture of us enjoying lunch an hour later all cleaned up sporting our finisher’s medals and shirts…and yes, Elvis too. 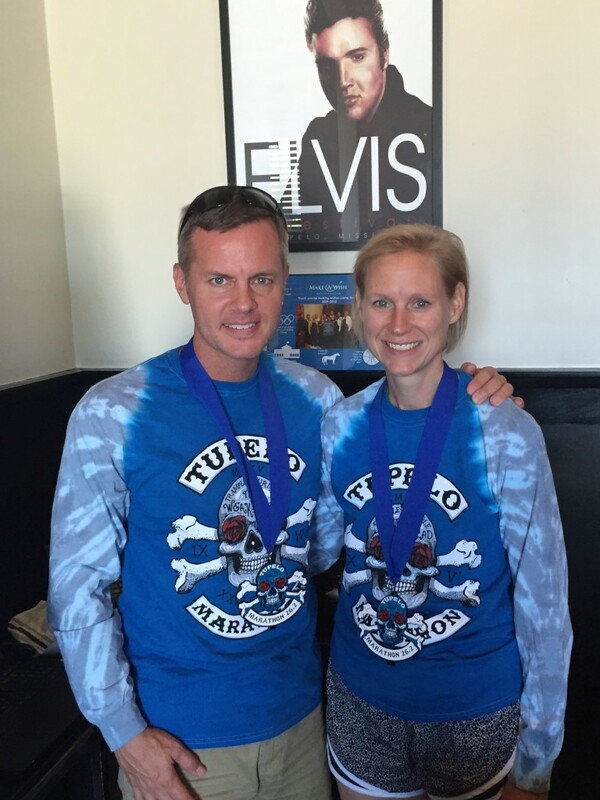 Joe & Mary Catherine – 2015 Tupelo Marathon finishers! Here’s some additional technical information about our performance during the race. 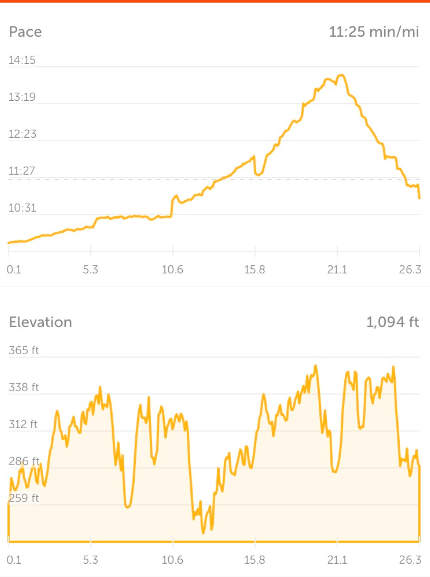 Our race pace and elevation profile.